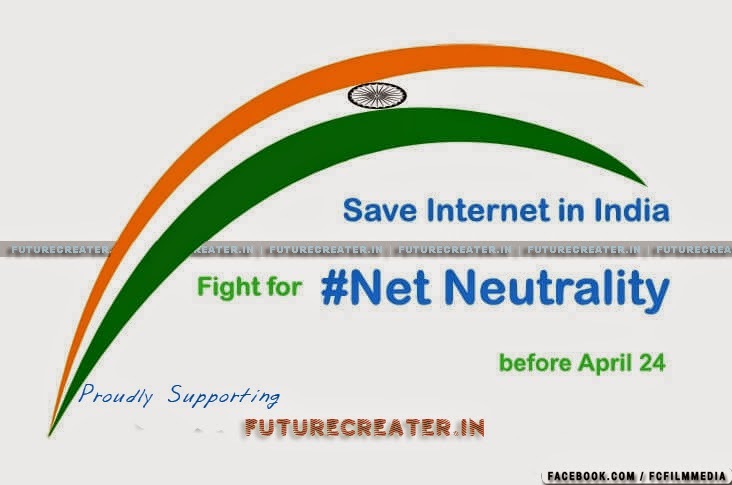 This page was created to support #netneutralityindia. You can do a lot more with just a little effort. From contacting MPs & popular people to open letters to being active on social media to having conversations with people you know and much more. Thank you for giving me this opportunity to share my views on the consultation paper published by TRAI on March 27, 2015 titled "Regulatory Framework For Over-the-Top (OTT) Services”. I am worried that this consultation paper makes sweeping assumptions about the Internet, and does not take a neutral and balanced view of the subject of Internet Licensing and Net Neutrality. Any public consultation must be approached in a neutral manner by the regulator, so that people can form an informed opinion. I strongly support an open internet, for which I believe it is critical to uphold net neutrality and reject any moves towards licensing of Internet applications and Web services. I urge TRAI to commit to outlining measures to protect and advance net neutrality for all Indians. Net neutrality requires that the Internet be maintained as an open platform, on which network providers treat all content, applications and services equally, without discrimination. The TRAI must give importance to safeguarding the interests of our country’s citizens and the national objective of Digital India and Make In India, over claims made by some corporate interests. I request that my response be published on the TRAI website alongside other comments filed, in line with past practice regarding public consultations. I urge that TRAI issue a specific response to user submissions after examining the concerns raised by them, and hold open house discussions across India, accessible to users and startups before making any recommendations. Question 1: Is it too early to establish a regulatory framework for Internet/OTT services, since internet penetration is still evolving, access speeds are generally low and there is limited coverage of high-speed broadband in the country? Or, should some beginning be made now with a regulatory framework that could be adapted to changes in the future? Please comment with justifications. No new regulatory framework in the telecom sector is required for Internet services and apps - and no such regulation should come into effect in future either. This question incorrectly presumes that regulation of the Internet is absent and there is a need to create it. Additionally, the technical language of “Over-the-Top” applications used in the consultation paper fails to convey that it is truly referring to the online services and applications which make today’s Internet which we all use; Facebook, Ola, Zomato, Paytm, WhatsApp, Zoho and Skype etc. The Internet is already subject to existing law in India - any extra regulatory or licensing regime will only be detrimental to the customer and to Indian firms developing online services and apps. Under the current regulatory framework, users can access the internet-based services and apps either for a low fee or for free where the application owners make money by selling advertisements based on user data. With additional regulations and licenses, it will make it expensive for these services to reach out to their customers eventually leading to higher prices and undesirable levels of advertising - which is against the public interest and counterproductive. It appears that the telecom companies are shifting goalposts. Many telecom companies have earlier argued in the consultation paper floated by TRAI on mobile value added services (MVAS) that it was not necessary to regulate these value added services. They said MVAS are already governed by general laws under the Indian legal system and comply with the security interests as they operate on the networks of legitimate telecom license holders. Internet platforms also are regulated and governed by general laws in addition to specialised laws such as the Information Technology Act, and the same treatment should be extended to them as well. As TRAI said previously in its recommendations after consulting on MVAS regulation: “The Authority preferred least intrusive and minimal regulatory framework and thus no separate category of licence for value added services is envisaged. After second round of consultations, the Authority is also not favoring registration of Value Added Service Providers (VASPs) or content aggregators under the “Other Service Provider (OSP)” category.” “Content shall be subject to relevant content regulation and compliance of prevailing copyrights including digital management rights and other laws on the subject (para 3.12.2). The content is subjected to content regulation/ guidelines of Ministry of Information and Broadcasting, Information Technology Act, 2000, Cable Television Networks (Regulation) Act, 1995, Indian Copyright Act etc., as amended from time to time. The content regulation shall be as per law in force from time to time. There should be consistency in the treatment of content across all kinds of media including print, digital/multimedia to avoid any discrimination. (para 3.13.3):” Imposing a licensing and regulation regime carry significant risks of destroying innovation. Launching new services and features will take more time and will make it difficult for new startups with low cash reserves to enter the market. It will basically ring the death knell for the country's fast-growing digital media sector. Question 2: Should the Internet/OTT players offering communication services (voice, messaging and video call services through applications (resident either in the country or outside) be brought under the licensing regime? Please comment with justifications. There is no need to bring Internet platforms offering communication services under the telecom licensing regime. The way this question is framed gives an impression that there is a clear distinction between communication services and other non-communication services on the internet. This is an incorrect presumption. Many internet services incorporate real time chat and video services to improve their customer engagement. A licensing framework will, for sure, work against customer interest and will stifle innovation. The cost of entry to the market would increase many times over which will be extremely detrimental to newer startups who might have more innovative offerings for the market. Telecom operators need to have licenses to operate since they use a public resource: spectrum. It utilizes the spectrum to transmit data packets, voice and SMS communication and acts a dumb pipe. However, communication services such as Skype, WhatsApp, Viber and others sit atop the networks and infrastructure already controlled and owned by the telecom operators. Where Voice-over-Internet-Protocol services connect into the normal switched telecom network, TRAI’s VoIP regulations already exist. Therefore, there is no need for internet-based communication services to hold separate licenses. Question 3: Is the growth of Internet/OTT impacting the traditional revenue stream of Telecom operators/Telecom operators? If so, is the increase in data revenues of the Telecom Operators sufficient to compensate for this impact? Please comment with reasons. There is absolutely no evidence to suggest that VoIP services like Hike or Skype are cannibalising voice revenues of telecom operators. In fact, heads of more than one Indian telecom operator have clearly stated the same over the past few months. For example, Airtel India CEO Gopal Vittal had said during the company’s earnings conference call, earlier this year, that there’s no evidence of VoIP cannibalisation of voice services. Last year, Idea Cellular MD Himanshu Kapania had also said that OTT apps like Viber have had some impact on their International calling business, but on regular voice calls, there was no impact. We also need to remember that data revenues also fall under the traditional revenue streams category as per the Unified Access License Agreement (http://www.dot.gov.in/access-services/introduction-unified-access-servicescellular-mobile-services). So, it is factually incorrect to say that increase in data revenues will affect traditional revenue streams. A Morgan Stanley report on the Indian telecom industry from last year mentions that data revenues is likely to contribute about 23% of telecom operators’ overall revenues over the next two years. A study jointly done by AT Kearney and Google estimated that telecom companies will earn an additional $8 billion in revenues by 2017 due to the proliferation of data and data-based services. Question 4: Should the Internet/OTT players pay for use of the Telecom Operators network over and above data charges paid by consumers? If yes, what pricing options can be adopted? Could such options include prices based on bandwidth consumption? Can prices be used as a means of product/service differentiation? Please comment with justifications. Internet-based services and apps don’t pay for telecom operators for using the network, and it should remain the same going forward. Forcing Internet-based services to pay extra for using a particular network negatively impact consumers and harm the Indian digital ecosystem. As mentioned in the above answer, data revenues of Indian telecom operators is already on an upswing and is slated to increase rapidly over the next few years, hence the argument for creating a new revenue source is not justified. Charging users extra for specific apps or services will overburden them, which in turn will lead to them not using the services at all. It is also akin to breaking up the Internet into pieces, which is fundamentally against what Net Neutrality stands for. Also, the Internet depends on interconnectivity and the users being able to have seamless experience - differential pricing will destroy the very basic tenets of the Internet. Question 5: Do you agree that imbalances exist in the regulatory environment in the operation of Internet/OTT players? If so, what should be the framework to address these issues? How can the prevailing laws and regulations be applied to Internet/OTT players (who operate in the virtual world) and compliance enforced? What could be the impact on the economy? Please comment with justifications. Firstly, there is no regulatory imbalance in regards to Internet-based services and apps. It is the telecom operators who own spectrum, which is a public resource, and hence need to be licensed. Internet services don’t need licenses. Telecom operators provided the pipe or network on top of which Internet services exist. So, there’s a clear distinction between the two. It also needs to be pointed out that Internet services are already covered by the Information Technology Act, 2008 and the Indian Penal Code. So, there’s no need for a separate regulatory framework or licensing. In fact, this was the exact argument telecom operators had earlier made while stating their case for not regulating mobile value added services (MVAS), which in essence is quite similar Internet-based services. Question 6: How should the security concerns be addressed with regard to OTT players providing communication services? What security conditions such as maintaining data records, logs etc. need to be mandated for such OTT players? And, how can compliance with these conditions be ensured if the applications of such OTT players reside outside the country? Please comment with justifications. The internet services and apps are well-covered under the existing laws and regulations. These include the Code of Criminal Procedure, Indian Telegraph Act, Indian Telegraph Rules, and the Information Technology Act and its different rules pertaining to intermediaries and interception. These different regulations allow the Indian government and law enforcement agencies to access the data stored by internet platforms when deemed legally necessary. Any additional regulations carry grave risk of breaching user privacy and would also require constitutional review - especially since the Government is still working on a proposed Privacy Bill. The government and courts also have the power to block access to websites on the grounds of national security and public order. It has taken similar steps in the past and has been widely reported by the media. The transparency reports periodically published by major internet companies suggests Indian government routinely requests for user data and blocking of user accounts. Between July 2014 and December 2014, Indian authorities had 5,473 requests for data, covering 7,281 user accounts from Facebook and the company had a compliance rate of 44.69%. Google had a compliance rate of 61% with respect to the requests made by different government agencies across India. Question 7: How should the OTT players offering app services ensure security, safety and privacy of the consumer? How should they ensure protection of consumer interest? Please comment with justifications. Although user privacy and security is of paramount importance, additional regulation carries the inherent risk of breaching user privacy which is not in the consumer’s interest. The Information Technology Act, 2000 already addresses the security concerns of the user. But more importantly, any criminal act committed using these platforms can be tried under the Indian Penal Code. So, there is no need to burden the internet platforms with additional regulations. Also, it is worth noting that many telecom companies in India have not made information publicly available as to whether and how they comply with regulations that guarantee security, privacy and safety of the customer. TRAI’s current paper fails to articulate why the internet services and apps should be brought under similar regulations. Question 8: In what manner can the proposals for a regulatory framework for OTTs in India draw from those of ETNO, referred to in para 4.23 or the best practices summarised in para 4.29? And, what practices should be proscribed by regulatory fiat? Please comment with justifications. ETNO is similar to India’s COAI which makes it an industry lobby group. Understandably, the suggestions made by ETNO heavily favor the telecom companies and will be detrimental to customers if India refers to their suggestions. ETNO’s stand have been widely criticized in the past. Europe’s own group of government regulators [Body of European Regulators for Electronic Communication (BEREC)] http://berec.europa.eu/files/document_register_store/2012/11/BoR_%2812%29_120_BEREC_on_ITR.pdf ETNO’s proposals could jeopardize the “continued development of the open, dynamic and global platform that the Internet provides” which will “lead to an overall loss of welfare”. Additionally, the international free expression group Article 19 says ETNO’s proposal “would seriously undermine net neutrality. According to Access Now, ETNO’s recommendations would have meant higher data charges for customers while from an entrepreneur’s standpoint, it will limit their ability to reach out to a wider market. For a small but fast growing startup and digital media sector in India, this can potentially ring the death knell. ETNO’s suggestions on this subject so far have failed to have been accepted by any government agency - including the regulators in their own host countries. It is therefore especially troubling that TRAI is choosing to make one of their proposals a pillar of this public consultation here in India. Question 9: What are your views on net-neutrality in the Indian context? How should the various principles discussed in para 5.47 be dealt with? Please comment with justifications. Net Neutrality, by definition, means no discrimination of traffic flowing on the internet with respect to speed, access and price. Chile and Brazil, which are developing countries just like India, have passed laws supporting net neutrality. This is in addition to government commitments to implement net neutrality legislation in the United States and European Union. India has 1 billion people without internet access and it is imperative for our democracy to have an open and free internet where users are free to choose the services they want to access—instead of a telecom operator deciding what information they can access. Internet apps and services are expected to contribute 5% to India’s GDP by 2020. That will only happen of entrepreneurs, big and small, have a level playing field that encourages innovation and non-preferential treatment—something that net neutrality ensures. Assuming there is no net neutrality, only the big players will be able to strike deals with telcos while the smaller players remain inaccessible, which will go against the principles of net neutrality as listed below: No blocking by TSPs and ISPs on specific forms of internet traffic, services and applications. No slowing or “throttling” internet speeds by TSPs and ISPs on specific forms of internet traffic, services and applications. No preferential treatment of services and platforms by TSPs and ISPs. It is also worth noting that the proposed framework will give too much power in the hands of the telecom companies, which is not healthy for the ecosystem. Question 10: What forms of discrimination or traffic management practices are reasonable and consistent with a pragmatic approach? What should or can be permitted? Please comment with justifications. This question assumes that traffic discrimination is necessary and is a norm. Rather, traffic discrimination should be an exception as it is against the principles of net neutrality. In such exceptional cases, telecom companies need to have the permission of TRAI or other competent government agency through public hearing to carry out “traffic management” to ensure transparency in the entire process. Further, it should be kept in mind that such steps shouldn’t interfere with the access, affordability and quality of the services. More importantly, https://ec.europa.eu/digital-agenda/sites/digital-agenda/files/Traffic%20Management%20Investigation%20BEREC_2.pdf jointly by BEREC and the European Commission suggest that the propensity of the telecom operators to restrict access of internet services is high. The report noted that telecom operators were most inclined to block and throttle P2P services on mobile as well as fixed line networks. VoIP, on the other hand, was blocked mostly on telecom networks. Keeping this in mind, TRAI needs to ensure that instances of discrimination of traffic should be few, far between and, above all, transparent. Question 11: Should the TSPs be mandated to publish various traffic management techniques used for different OTT applications? Is this a sufficient condition to ensure transparency and a fair regulatory regime? Publishing detailed reports of various traffic management techniques for different internet services is a step in the right direction but it is definitely not sufficient. I believe it gives a false impression to consumers that traffic management is a permissible act, which it is not as it goes against the tenets of net neutrality. Making the various traffic management techniques public would ensure transparency to some extent but it fails to bring in accountability on the part of telecom operators—which is equally important. There needs to be an auditing mechanism that would scrutinize and penalize telecom companies in case of any unlawful traffic management techniques. Also, telecom companies should be mandated to submit any traffic management-related data to TRAI, which should be made publicly available on TRAI's website. The need for transparency and accountability is highlighted during the recent case of Airtel allegedly throttling Ogle, an online video service, on its network (http://www.medianama.com/2014/12/223-airtel-net-neutrality-ogle-throttling/). Question 12: How should a conducive and balanced environment be created such that TSPs are able to invest in network infrastructure and CAPs are able to innovate and grow? Who should bear the network upgradation costs? Please comment with justifications The underlying assumption of the question suggests that currently there is an imbalance in the environment within which telecom operators and internet services operate. However, as I have pointed out it my previous answers, no such imbalance exists. Telecom firms and internet services have distinct functions. The former has to provide the infrastructure to access content and the latter has to provide the platforms for users to create content. As financial results of the telecom operators and analysis by various independent agencies have shown that revenues from data are soaring. So, it makes logical sense for the telecom operators to invest to upgrade and improve their network infrastructure. On the contrary, I would argue that there is no incentive for the telecom firms to invest to upgrade their networks if they charge the CAP instead of charging the customer for data. They would seek to further increase its revenues coming from the CAPs, a move that will be disastrous for India's telecommunications industry. Question 13: Should TSPs be allowed to implement non-price based discrimination of services? If so, under what circumstances are such practices acceptable? What restrictions, if any, need to be placed so that such measures are not abused? What measures should be adopted to ensure transparency to consumers? Please comment with justifications. Discrimination of services in any form is detrimental for the growth of the telecom industry itself and there should be no circumstance for a telecom operator to do so. Given the diverse nature of the Internet, telecom operators should not be allowed to determine what type of service should get more priority. For example, a consumer in India probably relies on VoIP calls to keep in touch with people abroad and if there is throttling of these services, it infringes on the user’s fundamental right of freedom of expression. An Internet service that a telecom operator thinks which could lead to traffic congestion, might be vital to consumers. Further, a telecom operator might use throttling to further a service promoted by them and induce consumers into using them, thereby eliminating choice. Transparency alone will not bring about a fair regime for users, and it is crucial that TSPs be prohibited from discriminating between services Question 14: Is there a justification for allowing differential pricing for data access and OTT communication services? If so, what changes need to be brought about in the present tariff and regulatory framework for telecommunication services in the country? Please comment with justifications. As I have argued in my previous answers, there should be no differential pricing for data access and internet services. Therefore, the need for a change in the tariff and regulatory framework is not required. It is important to note that nearly one billion people still don't have internet access in India - which means telecom companies stand to gain substantially from their data services in the near future. Moreover, different pricing is tantamount to discrimination which goes against net neutrality. As stated before, customers should be charged on the basis of volume of data used and not on the basis of the internet services they are accessing. Question 15: Should OTT communication service players be treated as Bulk User of Telecom Services (BuTS)? How should the framework be structured to prevent any discrimination and protect stakeholder interest? Please comment with justification. Treating OTT communication service players as Bulk User of Telecom Services again amounts to discrimination of data services and hence it should not be allowed. The question also further assumes that the stakeholders are only the telecom operators and not the consumers. If only the interests of the telecom operators are protected by treating services which compete with their traditional services differently rather than innovating themselves, it would lead to a situation of anti-competitiveness. Telecom companies have an interest in imposing their control over information and communication networks, but the price of that would mean stifling competition, increased barriers for innovation and business and eventually infringe on the fundamental rights of Indian citizens. Question 16: What framework should be adopted to encourage India-specific OTT apps? Please comment with justifications. Only two steps need to be taken to foster the growth and innovation of India specific apps and services. First, there should be no additional regulation or licensing and strong net neutrality laws should be enacted. These steps will ensure that India continues to have a diverse app economy where entry barriers are minimal and entrepreneurs can launch their product without having to worry about discriminatory treatment from the telecom operators. In such a case, the best product will win which will be beneficial for the customers and the telecom as well as the Internet industry. The agnostic nature of internet networks has boosted the growth of India’s app economy but we risk destroying this fast growing sector by violating net neutrality. Question 17: If the OTT communication service players are to be licensed, should they be categorised as ASP or CSP? If so, what should be the framework? Please comment with justifications. The question of categorising doesn’t even arise, because as mentioned earlier any extra regulations or licensing is going to be detrimental to the end user. Requiring licensing of online services and mobile apps under the current telecom framework in India will have enormous negative consequences. The impossibly onerous burdens imposed by such licensing would results in many such globally developed services and apps not being launched in India - and our own startup efforts to develop local versions of such apps being killed in their early stages. The net results would be decreased consumer benefit and a massive slowdown in innovation and reduced “Make in India” efforts due to the regulatory cost of doing business becoming very high. Question 18: Is there a need to regulate subscription charges for OTT communication services? Please comment with justifications. Subscription charges for such apps need to be allowed to evolve as it would in a pure market economy. The subscribers (buyers) would want to pay the lowest possible price, and the app developers/companies (sellers) would want to charge as much as possible, eventually leading to a fair price. Subscription charges for such Internet-based services have remained, more or less, quite low in India, especially because the cost of switching from one service provider to another is also quite low: This competition will ensure that charges remain fair, without the need to regulate them, going forward as well. As noted in response to earlier questions, existing Indian law also applies to online services - which would include the Consumer Protection Act and other regulations meant to prevent cheating or other illegal pricing issues. Question 19: What steps should be taken by the Government for regulation of non-communication OTT players? Please comment with justifications. As mentioned earlier, irrespective of what an OTT app is used for (communication, online shopping, etc) they’re all essentially Internet-based services, and hence there is no question of creating new regulatory measures. Question 20: Are there any other issues that have a bearing on the subject discussed? In the interim, TRAI should issue an order or regulation preventing network neutrality violations by telecom service providers. Some telecom companies have shown scant respect for the issues presently under consideration and despite its questionable legality have rolled out various services which violate network neutrality. Any delay in forming regulations or preventing them in the interim till the process is complete is only likely to consolidate their status. This is not only an affront to the Internet users in India but also to the regulatory powers of the TRAI. If the question of regulating subscription charges arises because of the fear of OTT communication services/VoIP cannibalising Voice services by telcos, then it needs to be pointed out that more than one telecom operator in India has already come out and said that there’s no evidence to support such a fear. Earlier this year, Airtel India CEO Gopal Vittal had clearly said during the company’s earnings conference call that there’s no evidence of VoIP cannibalisation of voice services (http://bit.ly/1DzZQ77 - pdf). Last year, Idea Cellular MD Himanshu Kapania had also said that OTT apps like Viber have had some impact on their International calling business, but on regular voice calls, there was no impact (http://www.medianama.com/2014/07/223-idea-cellular-viber/). 2. There is something factually incorrect about the statement “No blocking, No fast lanes. Never done it. Never will. #airtelpledge”. For the Indian Premier League in 2010, Airtel had provided a fast lane to users accessing YouTube, increasing their speed to 2 Mbps. Read about it here. Two years later, the Google-backed Measurement Lab (M-Lab) reported that Airtel and other ISPs had been throttling BitTorrent traffic in India for years . If Airtel says that it will not block and not provide fast or slow lanes in the future, then there should be a mechanism holding it accountable to that pledge. 3. Airtel Zero says that every Indian has the right to be on the Internet. We agree with that. However, Airtel Zero is not the Internet. Even if it has 10,000 websites paying Airtel, those 10,000 sites cannot replace the millions that comprise of the Internet. So, even though Airtel says that “We know that if we allow them to experience the joys of the internet, they will join the digital revolution”, we’re afraid that those users will get limited access, and every time they try and go out of Airtel Zero, they stop, because they will get a message that says that they cannot view the world wide web unless they buy a data pack. The best case scenario here is that they will be (rightly) warned that they will be charged per kb for going out of Airtel Zero. If that happens, they will be less likely to jump the fence around Airtel Zero, and experience the rest of the web. Since this would be the first time a lot of these people maybe accessing the internet, this amounts to those people being denied the knowledge of what their choices are, leave apart the right to choose. 5. Airtel Zero changes the way the we access information via the Internet. The web was created as an open platform, where anyone could set up and host their site anywhere, and be available across the globe. This is why sites hosted in India are available across the globe. Websites don’t tie up with and pay each telecom operator and ISPs in each country (hundreds across the world) so that consumers can access these sites. If the next 200 million users in India are on Airtel Zero, startups and other companies will have to choose between ignoring these customers or tying up with multiple Indian telecom operators. Historically, telecom operators have co-ordinated when negotiating rates with content owners (read). A toll free voice service is a support mechanism for most businesses, and not the sole entry point for the business like an app or a website. An Internet company has 100% dependency on Internet access providers and telecom providers, while that is not the case with most companies that use toll free voice services. This leaves room for potential abuse, in case of differential pricing, manipulation of access speeds, or monopolistic hiking of rates, like in case of carriage fees in Cable TV. Read what happened in Cable TV in India here. 7. Airtel Zero is not a marketing expense, it’s an access fee. It shifts the model of the Internet from a situation where a consumer pays Airtel to access whatever she wants, with the whole Internet being accessible, to where a company pays to allow its app or service to be accessible to Zero users, and access to the rest being limited. In sum our platform is a technology platform and is open to all application developers and their customers. Our platform only provides a choice of how the data that is consumed is paid for by any of the two - the application provider or their customer. Whether any application provider enrolls on the platform or not is entirely their choice. All we have is a technology. We do not have a product or tariff plan that we have launched. We simply have a platform. And every application developer and their customer is free to choose in an entirely neutral way what they want to do.